The two sides go head-to-head at Old Trafford on Wednesday for the 12th time in Europe but the first since the 2011 Champions League final at Wembley, which Barcelona won 3-1. 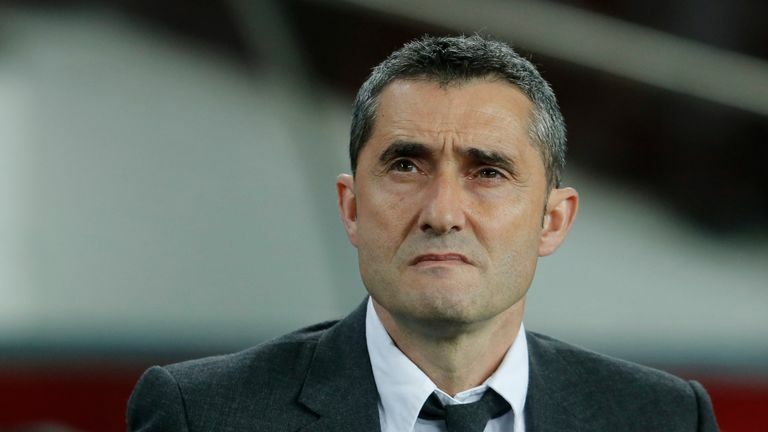 Despite only losing three of the eleven meetings between the teams, the Spanish giants have never beaten United at Old Trafford, something Valverde is well aware of but is hoping to change. "They are a powerful team. They are going through a good run, even if they lost their last match (against Wolves in the Premier League)," he said. "Physically they are really strong and they know how to put pressure on their opponents. They have players who are physically very powerful, and they can be dangerous strategically as well. "This match is a classic in European football. Barcelona have never won at Old Trafford I believe and we are going to try and change that." United manager Ole Gunnar Solskjaer and his assistant Mike Phelan were in attendance at the Nou Camp as Barcelona beat Atletico Madrid 2-0 on Saturday. Late goals from Luis Suarez and Lionel Messi opened up an 11-point lead at the top of La Liga, a win which Valverde insists was important to build confidence as his side continue to chase three trophies. "This is a crucial victory. Three crucial points but we must continue," he said. "Everyone knew the importance of this game and we are a little closer, but there are still 21 points to be awarded and we still need to be champions. "We wanted to win tonight because it brings us a lot of confidence. We have matches now that follow very quickly. "After Manchester United there will be in another week three La Liga games. "We must use the whole squad, that's the reality. We want to compete in all three competitions because we have not won anything yet."